Let's start with the show-offs - the orb weavers. The golden orb weavers (Nephila sp.) are still in their egg sacs, none yet hatched. The garden orb weavers are busy weaving their magic. The three I have found are all Eriophora pustulosa, not the same species as I had previously. These all have three little bumps on the end of their abdomens. The largest is Pustula, just a corruption of her species name. She lives on the back verandah. Archer lives under an arch covered with ivy pelargoniums. The third, of which I hope at least one makes it to breeding, is the smallest, but makes the most perfect webs outside the studio where I write, which I call my garret. So she is Garreta. Tonight, she was taking it a bit easy, not showing off like her fellow Eriophoras. Still gorgeous! I have lots of my very favourite spiders, the black house spiders (Badumna insignis) and their smaller cousins, the grey house spiders, Badumna longinqua. I'll only introduce one although I go out and talk to lots of them every night. You'll be pleased to know that none of them reply. Stonewalled has got me fascinated. 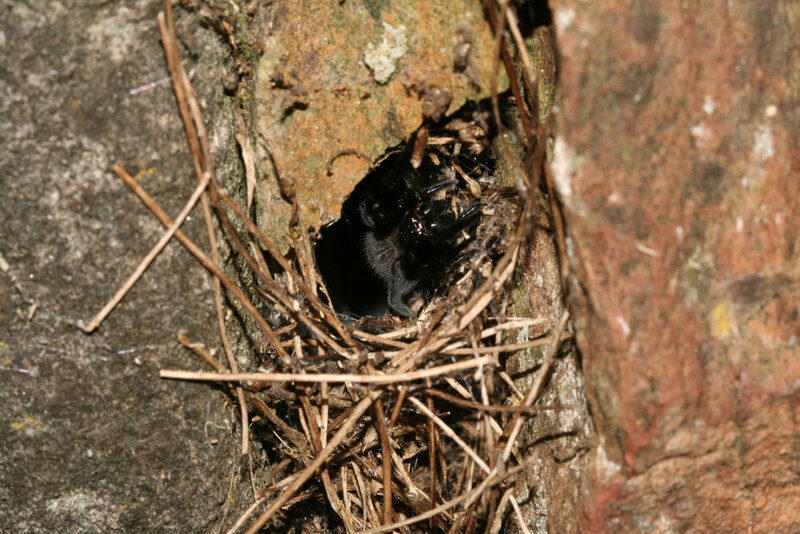 Black house spiders build funnelled webs, usually with two entrances or more, into a retreat. Stonewalled has done all that, her retreat going far back into the stone wall along the front of the house. But she has pieces of casuarina needles from the garden above her neatly woven into her web. I have seen trapdoor spiders do that. I have seen wolf spiders do that. But I've never seen a black house do it. Has anyone else? Here is my Badumna artist. So many regulars I want to introduce, but I will have to be selective. So last is my little common house sider who lives on the porch. Achaearanea sp. I call her Portico. Portico was using a tiny piece of twig caught in her web to stabilise herself as she wrapped a large prey. I couldn't identify it. There are lots more, but those are some of the spiders I check on every night. Their stories will be told here. Others may join, and of course, being low in the food chain, these spiders may become food. 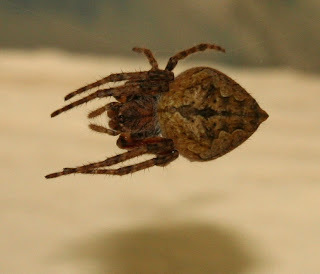 I have some wonderful photographs from another Castlemaine arachnophile. They'll appear here soon. Watch this space! 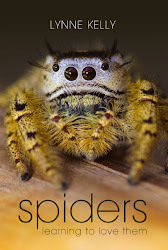 Love all arthropods - but it's spiders which top my list. Will check out your blog. Hi Larry, good to meet you. I'll check out your blog. We arachnophiles need to join forces and rid the world of their irrational fears. 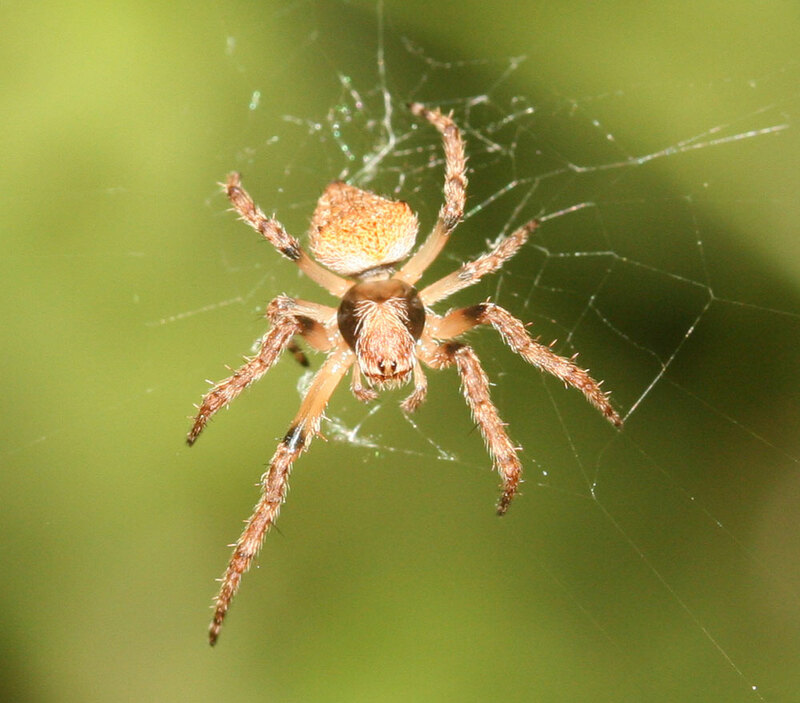 So much is going on, I seem to be photographing spiders madly and not blogging enough. Good to have you following! I just shooed out a black legged spider with a very shiny golden brown body. It was about 5/8" How can I find out what kind it was. I am not an arachnophile. It looked kind of like Garreta, its legs all up close to its head. What is a spider wiki? Sorry, I am also not a computerphile. Was your spider on a web? The garden orb weavers, like Garreta, are always on webs. If not, was your spider wandering in the house? There are no spiders like that in California which will do you harm. Brown recluse aren't there, despite rumours, and your description couldn't be a black widow. Is there anything here that looks like it? Sorry I couldn't be more help. There are so many of them! Amazing creatures. How good to hear from you! I only wish I updated this more often. I have a lot of photos and observations to add, but I am just finishing a doctorate and it is absorbing every minute. As for our golden orb weavers, mine are very tiny at the moment. They have just hatched from the egg sac. If I hadn't been observing the egg sac, I wouldn't have even known I had them. The garden orb weavers (as in the first three photos above) have been going all spring and summer, but all mine have disappeared now. The golden orb weavers mature much later, so we should start seeing them grown soon. It was April when I was reporting on them last year. Let me know if you observe any this year. I will update this blog very soon!